Part Three of an article from The New York Times on how the President’s proposed curtailment of the Affordable Care Act will act to the detriment of those that voted for him. Even now, with a repaved Route 62 running through it, Mountain Home is still what residents call a place you’ve got to be coming to, to get to. Joe Miles, now 65 and president of Integrity First Bank, grew up about 90 miles downstream on the White River and used to hunt and fish here as a child. “You couldn’t get here except by ferry,” he recalled. Steve Stamey, left, and Mike Browder fishing at Gaston’s White River Resort. The trout-filled river has lured fishermen to the area for decades. Spectacular Ozark scenery, lakes and a river crowded with trout, thanks to federal dam projects, started luring fishermen to the area in the 1950s. The next decade, a group of local businessmen pushed development at a time when the ambulance doubled as a hearse, and the traffic light at Seventh and Main Streets was removed because there were so few cars. One was T. J. McCabe, a co-founder of Integrity First, who traveled to boat and recreational-vehicle shows in the Midwest, giving away deeds for “one square inch of heaven” and telling the recipients to come visit their property. Vacationers — blue-collar workers with dependable pension plans — turned into retirees. They were drawn by the lower cost of living, natural beauty and, over time, a full-service, community-centered hospital that could treat hip fractures, diabetes and congestive heart failure without a three-hour drive. Marjorie Swanson’s parents moved to Mountain Home after researching best-places-to-retire lists. It was during a vacation visit that she and her husband decided it would be a great place to raise their children. Sloan Lively, 23, training development coordinator, giving Joann Bell, 86, a manicure at Elmcroft of Mountain Home, a senior living center. The town has long been a haven for retirees. Many of the retirees — who make up 30 percent of the county’s population — join a large network of volunteers at the hospital; a smaller circle of wealthier ones are big financial donors as well. In a county where two-thirds of the public-school children qualify for free or reduced-price lunch, such contributions have funded scholarships that helped pay for Ms. Green’s advanced nursing training, and college for Alison Swanson and her brother, Matt. In addition, they have underwritten emergency-room furniture, wheelchairs, free wigs for cancer patients and more. The stream of retirees slowed when the housing market crashed, and nest eggs turned into foreclosures. During the recession, those who came were like Sarah and Blair Brozynski, Chicago residents who had long vacationed here. They lost their jobs and moved to their summer house in Mountain Home, where they could live with their five children more cheaply. Now director of education at the hospital, Ms. Brozynski, 47, remembers when the factories laid off workers, the hospital stopped hiring and a wave of closings hit resorts. Car lots were full because no one was buying. “That was pretty sad, and we got a taste of it,” said Ms. Brozynski, whose husband is training to be a paramedic on a hospital scholarship. A son, also named Blair, is working in the hospital kitchen while he finishes college. She fears that if Republicans unwind the health care law, the tough times will return. Many were skeptical about the Affordable Care Act, but its funding is cited as a lifeline in extending coverage. Ms. Brozynski supported Mr. Obama’s health care legislation when it was first proposed, but many others in the county were skeptical. Some objected to the rise in premiums or a provision devised to keep the plan solvent — fining people who failed to sign up for coverage. Now, whatever the criticisms, the dozens of employees interviewed at Baxter Regional and elsewhere all expressed thanks that more people had insurance. Michael Haynes, a 64-year-old real estate agent, credited the Affordable Care Act with saving his life. He didn’t have insurance before 2014. Without it, he would not have gone for a routine physical, which led to a diagnosis of prostate cancer and Hodgkin’s lymphoma. After chemotherapy treatments, he is in remission. At the Christian Clinic — the health care provider of last resort — the number of nonpaying patients seen each week has dropped from 90 to about 50 because of the expanded coverage, said Dr. Paul Wilbur, the clinic’s chairman. 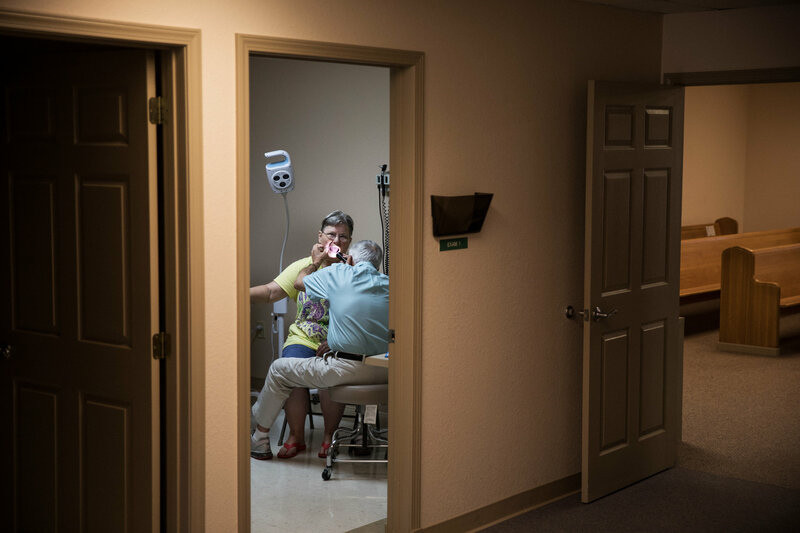 The Affordable Care Act has reduced the number of nonpaying patients at the Christian Clinic, the area’s health care provider of last resort. Dr. Paul Wilbur saw a patient in an examination room. “There were lots of parts in that bill that were done right, parts that were necessary,” Dr. Bradley said. There were significant shortcomings, too, he said, but they are fixable. Sadly, he added, bitter partisanship has made the law a lasting target. The endless fighting over the health care law has left some of the Swansons so frustrated that they wonder if starting from scratch is the only way to move forward. “Let it implode and start from ground zero,” Marjorie Swanson suggested at one point. But that prospect, echoing a threat by Mr. Trump, scared other members of the family. This concludes the three-part article on health care in the Ozarks.